Aig an àm seo den bhliadhna bidh mòran daoine – agus chan e na ‘twitchers’ a-mhàin – ag èisteachd gu faiceallach do gach ceilearadh eun a chluinneas iad, an dòchas gum bi an ceilear sunndach sònraichte a chiad chuthaige san sgìre nam measg. Bha na cuthagan riamh nan dearbhadh gun robh an t-earrach ann agus gun tigeadh an samradh a-rithist às dèidh a’ gheamraidh fhada, is iad a’ tilleadh mu dheireadh bho Afraga gu Breatainn. 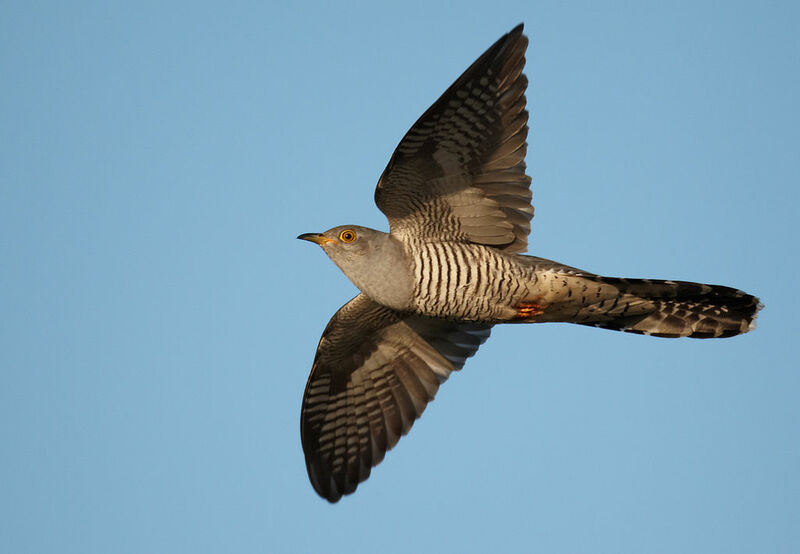 Tha iad air an comharrachadh ann an iomadh òran is pìos bàrdachd, tradiseanta is clasaigeach, bho Sumer is icumen in (13mh linn) gu On Hearing the First Cuckoo in Spring le Frederick Delius (20mh linn). Tha òrain Ghàidhlig gu leòr ann cuideachd far a bheil sinn a’ cluinntinn mun chuthag agus na bàird a’ cur fàilte chridheil oirre, mar O Fàilte ort fhèin, a chuthag ghorm, le d’ òran ceòlmhor milis! no Thig an smeòrach as t-Earrach, Thig a’ chuthag ‘s a Chèitein. – “Sneachda na Caisge, sneachda nan uan agus sneachda na cuthaige”. Ma thig na tri sneachdan sin, bidh an samhradh math. – San linn a chaidh seachad, nan do dh’ innseadh cuideigin do chàch gun cuala e a’ chuthag “gun bhiadh na bhroinn”, bha e ag ràdh nach robh e air ithe mus cuala e goirsinn na cuthaige airson a’ chiad uair den bhliadhna; agus bhathar a’ meas gur e bliadhna mhì-shealbhach a leanadh sin. Air an adhbhar sin dh’itheadh daoine “grèim-cuthaige” (rudeigin beag) nam b’ fheudar dhaibh a dhol a-mach tràth sa mhadainn ron bhracaist aig an àm seo den bhliadhna. Ach chan ann airson na dreuchd seo mar thosgair an earraich a-mhàin a tha cliù sònraichte aig a’ chuthag – tha taobh eile aice nach eil cho tlachdmhòr: fàgaidh i a h-uighean ann an neadan eun eile. ‘S fheàrr leatha neadan eun le uighean coltach ri uighean cuthaige, agus air monaidhean na Gàidhealtachd ‘s e an t-snàthadag, le nead air an talamh, a bhios a’ fulang as trice. Nuair a thig an t-àl a-mach, fàsaidh an t-isean-chuthaige mòr gu luath agus cuiridh e na h-uighean no na h-iseanan nas lugha eile a-mach às an nead. An uairsin bidh na h-eòin aig a bheil an nead a’ toirt biadh is cùram dhan isean-cuthaige a-mhàin, ged a dh’fhàsas e a dh’aithghearr nas motha na a ‘phàrantan’. Fiù ‘s nuair a bhios e a-mach as an nead, leanaidh iad e airson grèis gus a bheathachadh. ‘S ann bhon chàirdeas neònach seo a gheibh an t-snàthadag an t-ainm eile sa Ghàidhlig, an gocan-cuthaige – ‘s e ‘neach-frithealaidh‘ a th’ ann an ‘gocan’. Agus seo abairtean eile a tha a’ dèiligeadh ris an taobh seo den chuthag. – “Tha e coltach ris an t-snàthadag a’ leantainn na cuthaig” – nuair a bhios cudeigin daonnan a’ leanntain cudeigin eile, mar leanabh beag a bhràthair mòr. – “cur air ruith na cuthaige” a’ cur neach air ghocaireachd, no air gnothaich gun fheum, gu h-àiridh a’ chiad latha den Ghiblean. – Agus “gheibh thu e nuair a gheibh thu nead na cuthaig” – chan fhaigh thu a-chaoidh e! 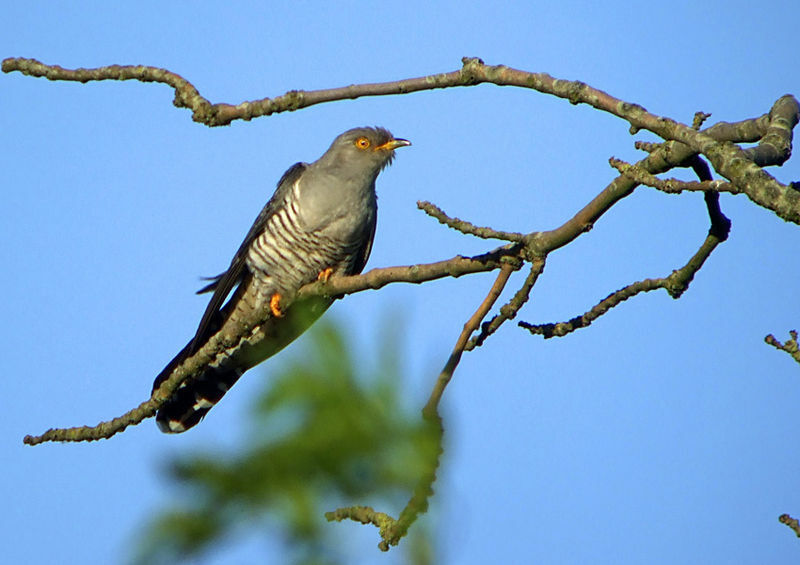 At this time of the year many people – and not only ‚twitchers‘ – pay particular attention when they hear birds singing, in the hope of catching the distinctive call of the first cuckoo in their area. Cuckoos have always been seen as evidence that spring is here and summer is on the way after the long winter, as they return at last from Africa to Britain. They are celebrated in many songs and poems, traditional and classical, from Sumer is icumen in (13th century) to On Hearing the First Cuckoo in Spring by Frederick Delius (20th c.). There are many Gaelic songs too with the poet welcoming the cuckoo warmly, such as O Fàilte ort fhèin, a chuthag ghorm, le d’ òran ceòlmhor milis! (Welcome to you, blue cuckoo, with your melodious sweet song!) or Thig an smeòrach as t-Earrach, Thig a’ chuthag ‘s a Chèitein (The mavis will come in spring and the cuckoo in May). – “Sneachda na Caisge, sneachda nan uan agus sneachda na cuthaige”(Easter snow, lamb snow and cuckoo snow) If these three snows come, it will be a good summer. – In the last century if someone said they had heard the cuckoo “gun bhiadh na bhroinn”, on an empty stomach, i.e. before breakfast, it was supposed to mean a bad year would follow. People therefore would grab a “grèim-cuthaige”, a quick ‘cuckoo snack’, if they had to leave the house very early at this time of the year. – and “cuthag-chluaise”, an ‘ear cuckoo’, meant a tell-tale, a child who would ‘sing’ on his friends. 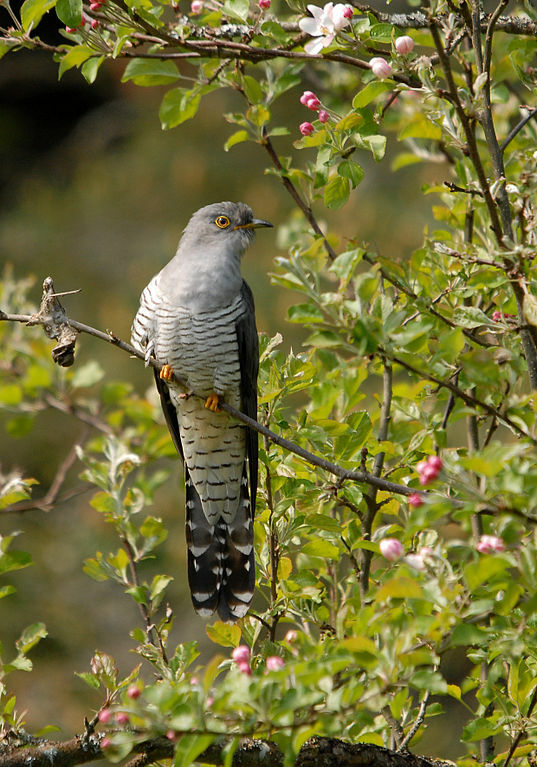 This led to the expression “Ge binn leinn a’ chuthag cha bhinn leinn cuthag-chluaise” – although we find the cuckoo itself pretty, we’re not so fond of the ‘ear-cuckoo’. 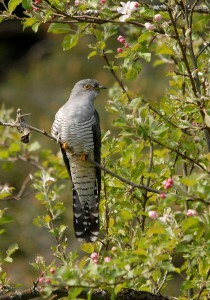 But it’s not only for this role as harbinger of the spring that the cuckoo has earned its special reputation. It has another, less attractive side: it lays its eggs in other birds’ nests. It prefers the nests of birds whose eggs are similar to its own, and in the uplands of the Highlands it’s the ground-nesting meadow-pipit who is its most frequent victim. 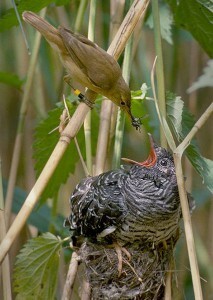 When the litter hatches, the cuckoo chick grows big very fast and throws the other eggs or smaller chicks out of the nest. Then the birds whose nest it is devote all their time to feeding and caring for the cuckoo chick alone, even though it soon grows bigger than its ‘parents’. And even when it leaves the nest, they follow it around for a good while and continue to feed it. It’s from this curious relationship that the meadow-pipit gets its other name in Gaelic, ‘gocan-cuthaige’, ‘cuckoo’s attendant’. – “Tha e coltach ris an t-snàthadag a’ leantainn na cuthaig” – ‘He’s like the pipit following the cuckoo’ when someone trails along behind someone else, like a child following his big brother. – “cur air ruith na cuthaige” – send someone on ‘the cuckoo run’ – sending him on a fool’s errand, especially on April Fool’s Day. – And “gheibh thu e nuair a gheibh thu nead na cuthaig” – ‘you’ll find it when you find the cuckoo’s nest’, i.e. never! Dwelly air loidhne, Uicipeid agus Ruairidh MacIlleathain air làrach SNH.